With ever increasing global governance requirements, companies need to find ways to drive down cost and effectively manage global risk and compliance processes. One means to achieve efficiency and improve ROI is through automation, however implementing new automated systems can be complex, time consuming, and costly. The webcast will be led by Philip Tillman, Managing Director, CQS GRC Solutions (Pty) Ltd and Troy Konis, Turnkey Consulting. 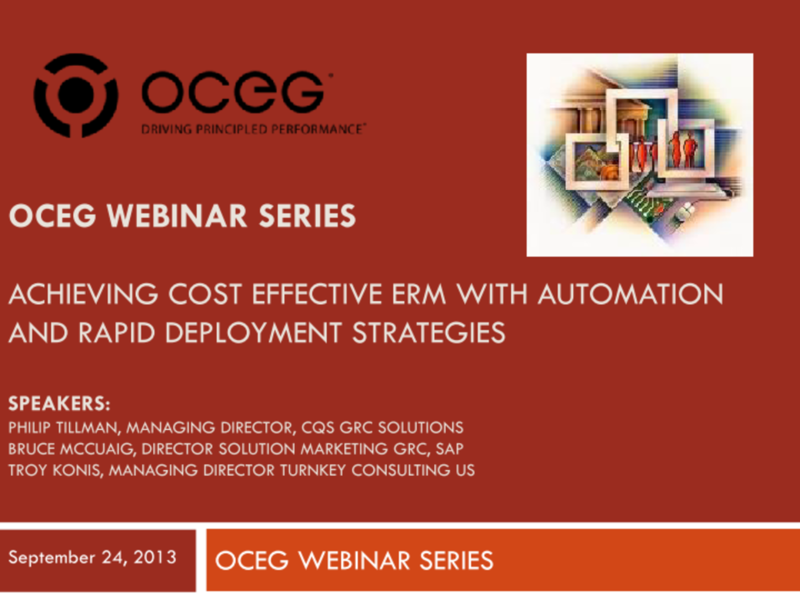 We have emailed instructions to access Achieving Cost Effective ERM Slide Deck to . Make sure the email arrives in your inbox: either add "support@oceg.org" as a safe sender to your email platform, or if you use Gmail, drag our email into your Primary tab.